Chet, left, and Jim Doxas, two members of the Doxas Brothers Quartet who will play, along with Brad Turner and André LeChance, at Mahon Hall on Feb. 6. Jazzuary 2019 continues this Wednesday, Feb. 6, when the Salt Spring Jazz and Blues Society hosts the exciting Doxas Brothers Quartet. 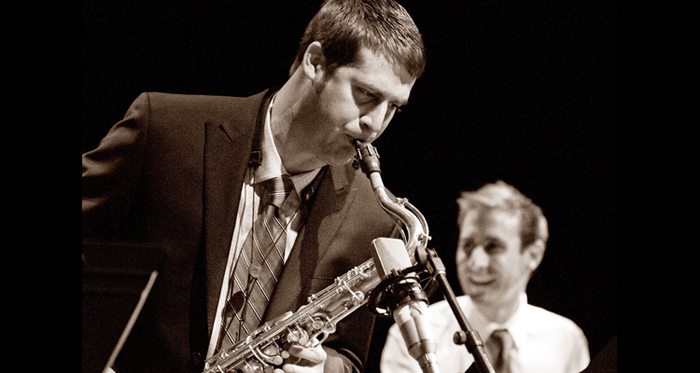 The group features tenor saxophonist Chet Doxas and his brother Jim, a drummer, who are originally from Montreal and a well-known musical family. Jim still lives in Montreal, while Chet is based in New York City. Chet has released seven albums as a leader and co-leader, and has worked with artists as diverse as Carla Bley, John Abercrombie, Rufus Wainwright, Maria Schneider, Sam Roberts Band, Ingrid Jensen, Phil Dwyer and Oliver Jones. Jim and Chet Doxas will be joined for this occasion by two Vancouver stars: trumpeter Brad Turner and bassist André LaChance. Young knows Turner well since he was her teacher when she studied jazz at Capilano University. Quartet members have both won and been nominated for numerous awards, including Junos and Grammys. John Moore of the Salt Spring Jazz and Blues Society echoes Young’s enthusiasm. He said the quartet gets a lot of attention for its cutting-edge sound that is also really accessible for audiences. “This is a unique opportunity to get a group like this on Salt Spring,” he said. The concert, which will feature both original compositions and jazz standards, is at Mahon Hall beginning at 7:30 p.m.
Tickets are at Mondo Trading or the door. The first concert in the Jazzuary 2019 series was the Jon Miller Organ Quartet, which performed on Jan. 27. The last event is the Swing Shift Valentine’s Dance at Fulford Hall on Saturday, Feb. 16.